Shocks and struts provide for a stable, smooth ride. If you pay attention to some of the ads you see on TV, you’d swear that your car’s shocks and struts are all about comfort. And there’s little doubt that good shocks and struts will keep your car’s ride comfortable. But that’s only a small part of the story. Because shocks and struts do more than just provide a smooth ride. They compensate for irregular surfaces, to keep your car’s wheels in proper contact with the road. That’s important for maintaining control and stability, and can even affect tire wear. Which means that good shocks and struts are more than just an issue of comfort: They’re an issue of safety. 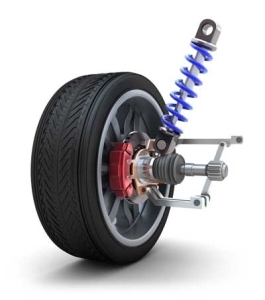 Struts take things a step further than shocks alone: In addition to compensating for roadway irregularities, they’re actually the basis for your car’s entire suspension system. They hold the wheels in place and maintain the geometry necessary for your car to remain upright and steer properly. Your friends at Cottman know this. Their technicians are well versed in the importance of good shocks and struts. And they’re very familiar with the differences between standard duty, heavy duty, and radial shocks and struts. They can evaluate your driving needs and help you choose the right shocks and struts for your particular situation. If you’d like to have your car’s shocks and struts evaluated, find your local Cottman to set up an appointment. Let them know about any handling problems you’ve noticed; they’ll check the condition of your car’s suspension and steering. And, if they find you need your shocks or struts replaced, they’ll help you choose the best ones for your vehicle and driving characteristics.